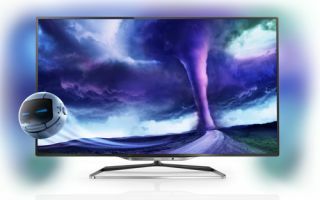 TP Vision unveils extensive new range of Philips TVs for 2013 | What Hi-Fi? We first caught a glimpse of TP Vision's 2013 Philips TV range at CES back in January, but at the time everything was under embargo except its prototype glasses-free 4K 3D screen. Today all is revealed, and we have details of the forthcoming Philips 4200, 5000, 6000, 7000 and 8000 ranges, due on sale in the second quarter of this year. That's quite a line-up. It begins with the PFL4208 small-screen models in 22in and 24in sizes, with integrated wi-fi for connecting to smart TV services, LED backlighting and the option of making Skype video calls using an optional USB camera. A PC input means they can also be used as computer monitors. Next up is the PFL5008 range in 32, 42, 47 and 50in screen sizes. All feature Full HD resolution, passive 'Easy 3D' tech, dual game viewing, 2D -to-3D conversion, LED backlighting and two-sided Ambilight. There's also Ethernet and wi-fi connectivity for smart TV, three HDMI inputs and USB recording. Step up to the Philips PFL6008 series and you get a new 'frameless' design, 500Hz perfect Motion Rate, Perfect 3D Natural Motion, two-sided Ambilight, Easy (passive) 3D and a built-in keyboard on the remote control. Other highlights include Philips's 'SimplyShare' tech which allows you to stream wirelessly to and from mobile devices to the TV, Wi-Fi Miracast and support for the Philips MyRemote app. Available sizes are 42, 47, 55 and 60in. The Philips PFL7008 and PFL7108 models have a silver-black or white frameless design, three-sided Ambilight, advanced connectivity and streaming features. The 7008 features a bezeless front glass panel sitting in a thin rim made of black, brushed aluminium with a silver-coloured strip below the screen. In contrast, the 7108 features a white lower detail, stand and rear cover. Both have an integrated Skype camera. They include the streaming and sharing technology used in the PFL6008, and come in 42, 47 and 55in sizes. Last, but by no means least, is the flagship PFL8008 range. This brings "a clean stainless steel design with superior picture and sound quality". The glass screen has a dark steel surround and polished chrome 'U Frame' stand, with a Skype camera in the Philips badge below the screen. Powered by high-performance, dual-core processors, the PFL8008 TVs offer 1400Hz Perfect Motion Rate plus Super 3D Resolution, three-sided Ambilight, smart TV functionality and media sharing via wi-fi. They are active 3D designs and come in 46 and 55in screen sizes. All the new TP Vision Philips TVs will be available in the second quarter of 2013. UK prices are still to be confirmed. We hope to find out more about the TP Vision sets during the European press launch in Amsterdam next week.